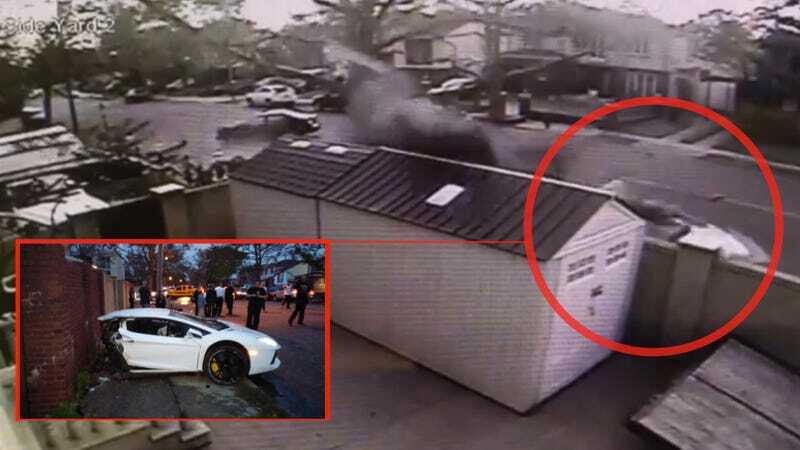 The $400,000+ Lamborghini Aventador destroyed dramatically at the hands of a midsize sedan in Brooklyn this weekend conveniently did so in front of a couple of cameras. While this is terrible carnage, it does show off how modern safety equipment is supposed to work. As you can see in the video, the sedan (apparently a Mazda) is attempting to turn into a street or driveway when it clipped the Aventador. Witnesses have described the Lamborghini as "approaching at a high rate of speed," which is hard to determine in the video but plausible. What's easy to determine is the person in the sedan didn't exercise great judgment or vision in deciding to turn in front of the Lamborghini. The safety cell of the Aventador, for its part, did what it was supposed to do and reduced the energy of the accident by separating itself from the rest of the car. That's probably less comforting when you see the bill for reconnecting it.